People that play slots games seldom obsess about the question of its origin. In the same way we don't think much about the inventor of the TV set or elementary bulb. But it's really interesting to know the person whom we can owe the possibility to use all the conveniences in addition to amusing varieties. So, slots games are descended from the USA over a hundred years ago. The date of its birth is quite contradictory. The authentic inventor of slots is Charles Fey, but nevertheless the date of slots birth is related closely to the date of 1891 and the names of Sittman and Pitt of Brooklyn. This machine included cards that were fixed to drums. The cash prizes were forbidden, thus the visitors took their slots payouts in the form of food and beverages. But in spite of everything they were contented. Western bars were full of such entertainment machines. Taped cards on the drums and lever mechanism couldn't continue their existence for a long time, and inventive Charles Fey was engaged into the slots history. Charles Fey was an ordinary mechanic from San Francisco who had lots of shocked ideas that could change the entertainment world, more exactly the development of slots history for better and more agreeable. He wasn't a gambler himself, and maybe this factor helped him not to become addicted and make everything on the highest level from the mechanic point of view. So, the end of 19th century is considered to be the date when the first slot machine was created that was called Liberty Bell - by the name of one of the symbols on the reels. 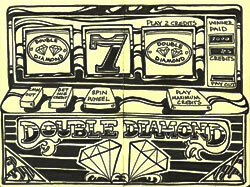 Charles Fey made a very significant step in the development of slot machine work. The screen of the machine consisted of five symbols that were on three reels. The visitors that wanted to try it had to pull the lever and thus they launched the game. As soon as the player won, the assistant had to present him the payouts. You see, that Liberty Bell wasn't automatic but nevertheless it was the best replica from which were made the next slots innovations. Then Charles Fey joined Mills Novelty Company that was leading in the business of the entertainment gambling. Fey was proposed to sell his rights for the machine, but he refused and received his deserved percentage from the casinos. Fey was dreaming about the day when he could convert Liberty Bell into the automatic beauty, but it was still iron and heavy. From this time, slot machine was given over to different companies with the rights of owner that was Charles Fey. During the slots history, they were trying to innovate it, renamed it, and accomplished some changes: Liberty Bell was renamed to Mills Liberty Bell, then to Operator Bell, Big Bertha. The machine was turned into the wooden one, had the gooseneck slot where the visitors pulled their coins to play. Then it became electronic and very profitable. Lots of other symbols were added later, and it really reached the highest popularity in the casinos throughout the world.